Several yield trials have been planted on snout beetle infested land. One field trial planted in 2011 in Adams has been completed. The Seedway 9558 population showed significant increases in yield between the unselected base population (7.05 tons per acre two year totals) and the population selected for snout beetle resistance for 7 cycles (7.63 tons per acre). 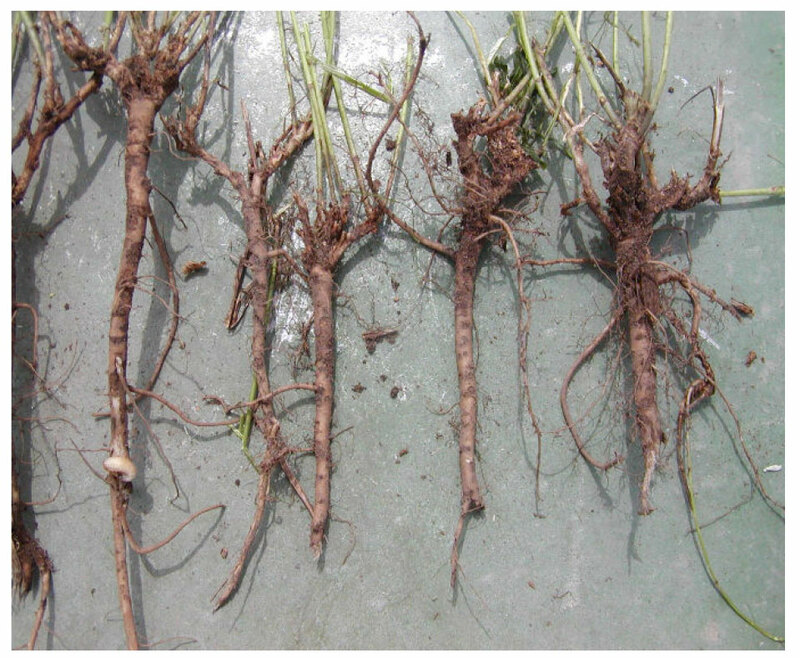 In fall 2013, plants were dug from the trial and the plants were rated for root feeding damage (1=no damage to 5=severe damage). 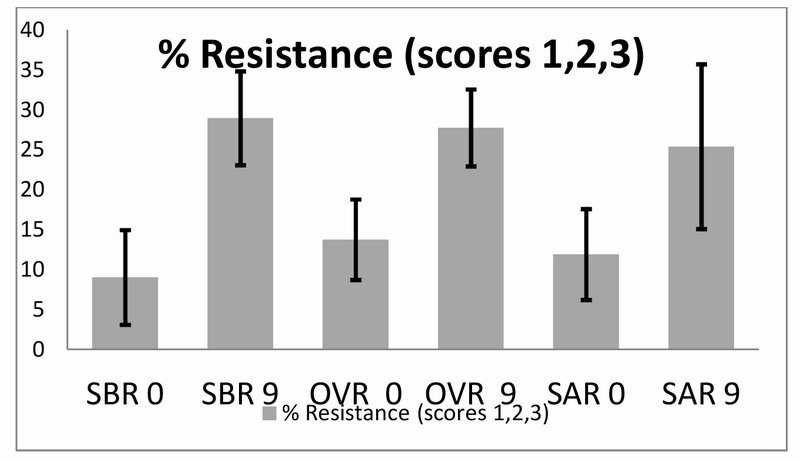 The alfalfa populations selected for 7 or 8 cycles ranged in percent resistance from 26% to 38%, whereas the original unselected base populations ranged from 13% to 17% resistance. Thus, selection for snout beetle resistance in the greenhouse resulted in alfalfa populations that have improved resistance in fields with high populations of alfalfa snout beetle. A second field trial planted in 2013 in Lowville has been completed. This trial was harvested twice in 2014, the first production year. Alfalfa populations selected for resistance to snout beetle for 9 cycles had significantly higher forage yield than the unselected populations (Table 1). Table 1: Yield Results from Lowville, First Production Year, t/a = tons per acre dry matter, selection was for resistance to alfalfa snout beetle. Plants were dug from the trial in fall 2014 and the roots were rated for snout beetle feeding damage. The alfalfa populations selected for resistance to snout beetle feeding damage for 9 cycles had significantly less root feeding damage than the unselected populations (Figure 1). Figure 1: Three alfalfa populations and percent resistance to Alfalfa Snout Beetle. Plants were dug from the 2013 trial in Lowville and rated for Alfalfa Snout Beetle damage where 1 is no feeding damage and 5 is severe damage. The root feeding damage by snout beetle on alfalfa is devastating to forage production and plant stands. The root system of a plant that snout beetles have damaged is not able to sustain forage production. Once the snout beetles infest the alfalfa roots, the roots lose the ability to fix nitrogen for the plant, the roots are eaten so cannot absorb soil nutrients and water for the plant, and the snout beetle larvae burrow into the roots further disrupting root function (Photo 1). Photo 1: Alfalfa roots infested by Alfalfa Snout Beetle. Note the root scars and the larvae living in the root on the left of the photo. Copyright © 2019 · Alfalfasnoutbeetle.org · Site Design: Riverside Media, LLC.